As a runner, protein running snacks that nourish my body are a necessity. And since I run frequently it needs to be something that tastes good too. While you usually get to hear from Colleen, I’m very excited to share why I choose to fuel my runs with ZEGO, but first, let me introduce myself. My name is Danielle and I have the pleasure of helping run the day-to-day operations at ZEGO. Since I started two years ago, we have added delicious new flavors and grown as a company. I first started running in college with the sole goal to get in shape for my wedding. I would run the same two loops around both Willow and Watson Lake in Prescott, AZ. None of my friends were into running, so this became my “me time”. After college, I moved to Indiana, got an office job, and needed a way to release tension, clear my mind, and stay in shape. Running was a clear choice as it was something I had grown to love – It’s a great way to explore new cities and meet new people. I soon registered for my first half marathon – The Mini-Marathon, which is the largest ½ marathon in the country! Race day arrived and, as luck would have it, it was one of the hottest and most humid days on record! I was missing that the crisp, high desert air. A couple hours later I crossed the finish line feeling depleted and unhappy with my time. I told myself I was never going to run another race again. But that feeling didn’t last long as I soon forgot how miserable I was and could only remember the adrenaline of race day. Since then, I have run several other halfs, and I completed my first full marathon this past February at the beautiful Surf City course in Huntington Beach. With all this training, I have certainty been victim to injuries, and come to know snacks to avoid, snacks to live by, and that post-run high runners love to talk about. Running gives me time to myself, and allows me to decompress. 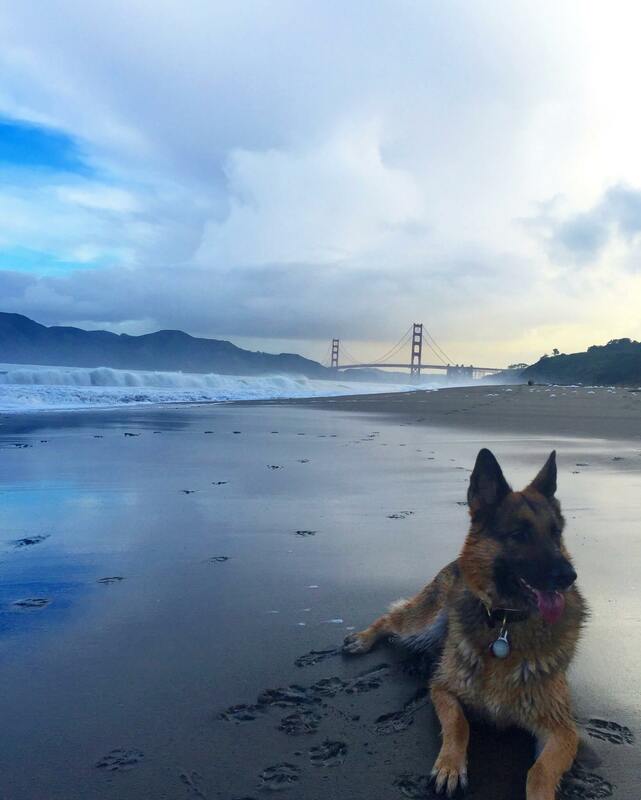 On most days, you can find me and my dog, Kaibry, running through Golden Gate Park or the Presidio in San Francisco. 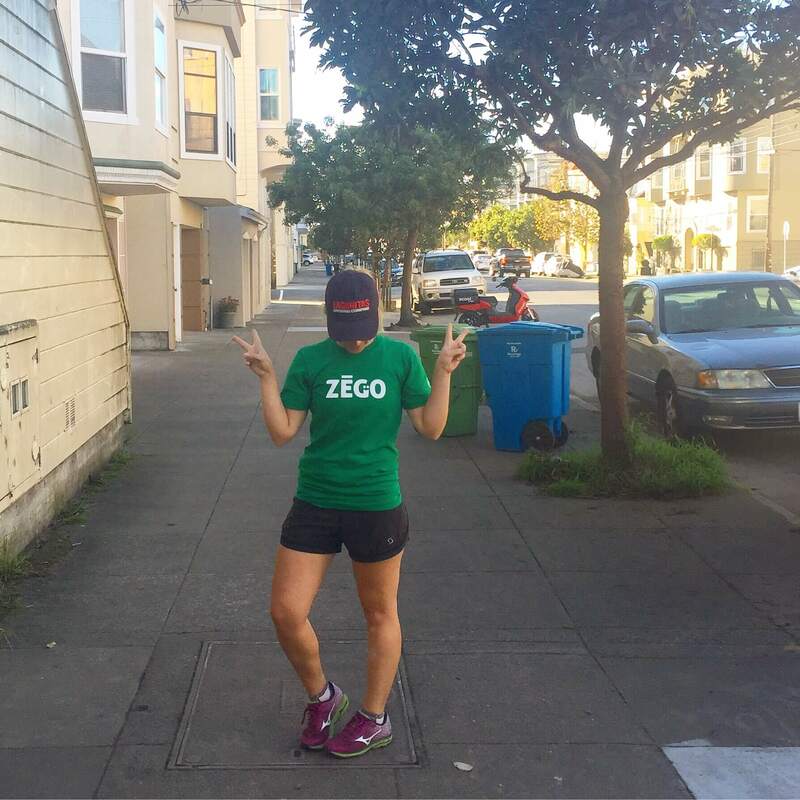 Currently, I am training for the San Francisco marathon in July, and ZEGO bars fuel every single one of my long runs. Thankfully, I do not suffer from severe food allergies like many people these days, so I don’t have to think about allergies when I choose a running snack for my pack. However, I still care about what I put in my body. Success as a runner, especially a long distance runner, relies on being able to provide your body with healthy fats and protein, along with being quick and accessible. Are there artificial ingredients or “natural” flavorings? Is it Organic / Non GMO? Is it loaded with too much protein for your body to easily digest? What is the sugar content (too much and/or poor quality)? Does it contain artificial sweeteners? Does it contain animal products? That list doesn’t even cover the various food allergies or other restrictions you might have! ZEGO bars do not contain any natural (or artificial) flavorings, which is incredibly hard to find. In fact, “Natural Flavorings” is the fourth most common ingredient found on food labels. It outranks other common ingredients like salt, water, and sugar! CNN has a great article explaining why natural flavors aren’t as “natural” as they sound – and they do a great job breaking down the very slight differences between natural flavors and artificial ingredients. ZEGO bars also meet the Organic / Non GMO criteria. The Seed+Fruit bars are certified Organic and do not contain GMOs. All of the Just Fruit and Fruit+Chia bars are also certified Non GMO, which is perfect for keeping your snacks as clean as possible. Every ZEGO bar is certified vegan, which means no whey protein or other animal products. This allows our bodies to digest the bars easily. As a runner, the last thing I want is to consume something that is going to upset my stomach. The protein in ZEGO bars is from Sacha Inchi Seed protein – which is amazing! It contains more omega 3 fatty acids than salmon, and is also the least processed protein on the market. Right now, I am gearing up for the San Francisco marathon, and have been enjoying a ZEGO Apple Cinnamon bar before every run. On my long runs, I like to hide a spare ZEGO Chocolate bar in my back pocket to refuel, along with a ZEGO Just Fruit Raspberry bar. These are perfect refreshing snacks that will give you just the right amount of energy boost to finish out those last couple of miles. Bonus – they don’t melt, so they travel well in your pocket or car! Whether you run, play sports, or are busy on the go, I can’t recommend these bars enough. I mean, how can you go wrong with a snack that tastes delicious, is loaded with easily digestible superfoods, and is changing the food industry by providing unprecedented levels of transparency. (Curious about what I mean by transparency? Take a look here to learn about how we’re revolutionizing the food chain and industry!). Why do you choose to run? 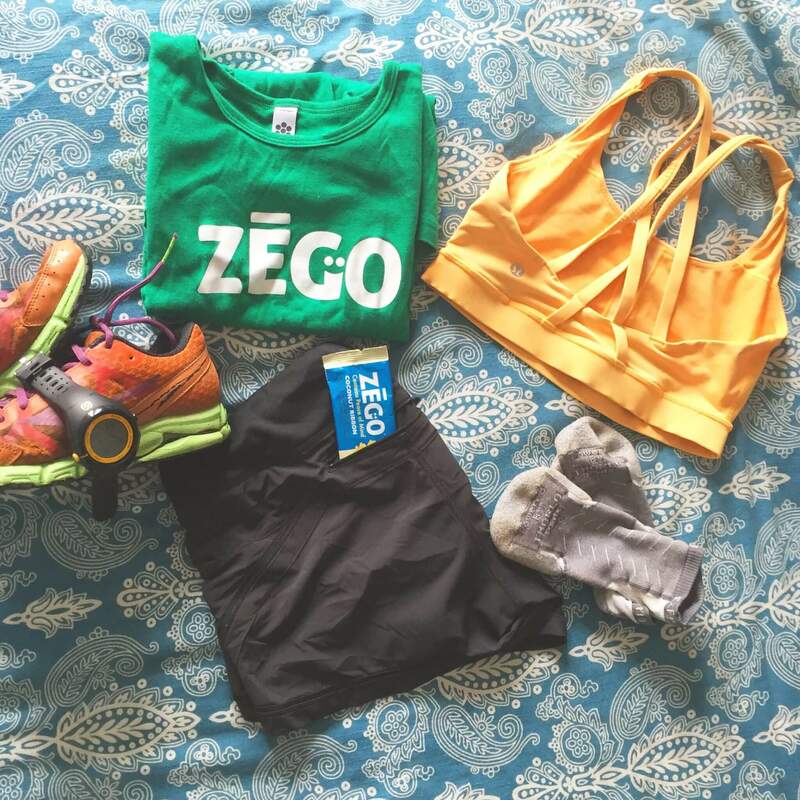 Have you tried ZEGO snacks as your running snack option? We love hearing from you, so keep sharing your pictures and stories with us! It helps us stay motivated and encourages us to continue to “Raise the Bar”.